This free online casino game is of 20 line and 5 reels with an additional offer of 15 free spins bonus and is quite popular all over the world and is played quite frequently by the casino fans across the globe. The game also possesses 2x wild symbols, and three scatter symbols; anywhere the free spins are triggered. The jackpot is randomly featured, and the chances of hitting it are directly equivalent to the higher the player bets on this game. The player stands to win the jackpot of Cleopatra’s gold if the player gets five Cleopatra’s symbols falling in one line. The Pyramid is the free scatter symbol, and if it appears thrice or more the player gets a free game bonus that is 15 free spins discussed earlier. Autoplay option in this game helps the players to relax while the machine plays on behalf of the player(s). 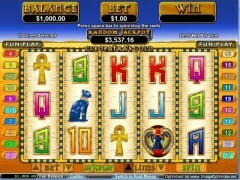 Cleopatra's Gold is the video slot game that is developed by the Real Time Gaming at 2009. Game draws the inspiration from Egyptian culture & includes beautifully made 2D elements. Even though there are many Egyptian themed games accessible nowadays, the Cleopatra's Gold is the perfect game for one interested in classic & old school slot game experience. This game as well includes many interesting features, which add diversity, whereas offering huge opportunities for the high payouts. Whereas it is "Cleopatra" slot game, it’s not popular B&M game made. As one will expect, lots of these symbols in game are totally based on architecture and culture of the Ancient Egypt. More lucrative symbols of the game include Scarab Eye symbol, Eye of Horus, Ankh and Egyptian Gods Bastet, Pyramid and, Cleopatra herself. Other symbols in game are the card symbols ranking at Nines - Aces. Pyramid is a scatter symbol & Cleopatra symbol is wild. Even though this game is 2D, it communicates the Egyptian feel, all thanks to beautiful images of the hieroglyphics & Ancient Egypt, which lie in game's background. The Cleopatra's Gold gives player 5 reels and 20paylines. Before starting every spin, player may have an option of selecting from 15coin values of betting. The coin values will range from $.01, way over $5, and translating in maximum betting sum of $100. The players can choose which pay lines to activate and de-activate before every session. Commonly used strategy of the game is activating all the pay lines & spread betting denominations over them. Maximum payout on paylines will get activated by lining 5 Cleopatra wild symbols at single spin. When player manages doing this, they will get 10,000 coins. Thus, aligning 5 of other Egyptian symbols can lead to the payout of over 1000 coins. But, if Cleopatra Gold Slots wild replaces these symbols, then payout will be twice as on forming the winning combinations. Thus, you will have a very high change of winning the game and its offers you some amazing options to play the game and win huge amount.